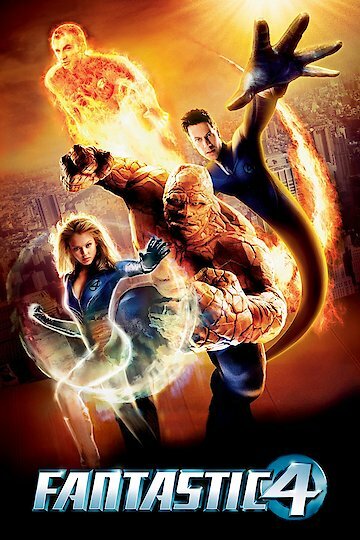 The Fantastic Four is the big screen telling of the origin story of this popular comic-book super-hero team starring Jessica Alba, Chris Evans, Ioan Gruffudd, Michael Chiklis and Julian McMahon. It tells the story of five individuals who discover powers and all the pros and cons that come along with them. Extremely intelligent and socially awkward Reed Richards is a poor scientist that wants to study first hand a cosmic wave that is passing by the Earth. Reed convinces former MIT classmate, now CEO of his own company, Victor Von Doom to fund the research and provide use of his space station. Reed recruits his former girlfriend and fellow scientist, Sue Storm her brash, arrogant brother Johnny Storm, and Reed's friend and astronaut, Ben Grimm. Things go awry on the station and all five are exposed to the cosmic radiation. They survive and come back to Earth realizing the radiation has caused mutation. Reed discovers the ability to stretch his body in elastic ways, Sue can create invisibility force fields, Johnny is able to envelop his whole body in flames, Ben Grimm's whole body becomes made of stone, and Victor's skin starts to become metal and can conduct and produce electricity. All of them deal with their new-found powers in different ways. Reed rents a penthouse apartment in New York City to study the effects of the radiation while Sue, Johnny and Ben move in. Sue tries not to be "invisible" to Reed romantically, Johnny uses his powers to increase his fame as a dare-devil, Ben deals his wife leaving him because of his appearance, and Victor becomes a recluse, blaming Reed for what happens. The four of them start to use their powers to help the people of New York, and find themselves struggling to get past their differences to face Victor Von Doom who seeks to divide and conquer for revenge. Fantastic Four is currently available to watch and stream, download, buy on demand at Starz, Amazon, Vudu, Google Play, FandangoNow, iTunes, YouTube VOD online. Miles Teller, Kate Mara, Michael B. Jordan and Jamie Bell star in this update of the Marvel superhero franchise. Next year's reboot of the disappointing 2005 version of "The Fantastic Four" is maybe not the most highly anticipated superhero movie in the works right now, but news this week of the new movie's cast generated some discussion. The cast will feature a couple of hot new names, but like all superhero casting decisions, these are sparking controversy.